There have been the disappointing, embarrassing and uncertain times for the Bulls this season, the 27-point blown lead at home to the Bucks, the Bulls next home opponent Wednesday with Scott Skiles out and Jim Boylan in as interim; the home losses to New Orleans and Charlotte, two of the four losingest teams in the NBA. There were the blowout losses to the Clippers when it seemed the Bulls were unable to compete, the languorous loss to the Hawks and the Christmas day humiliation against the Rockets. But as the Bulls close in on the halfway point of the 2012-13 season, they’ve moved to 19-13 after putting on a basketball clinic Monday in a 118-92 win over the Cleveland Cavaliers. And at 19-13, the Bulls suddenly are projecting out to a 49-win season. And that’s without Derrick Rose, who is expected to return from injury later in the season. “We’re gelling,” said Carlos Boozer, who had his fifth consecutive double/double with 24 points and 11 rebounds, plus four assists as the Bulls starting front three totaled 15 assists in a brilliant exhibition of unselfish and efficient play. It was a beautiful basketball exhibition, assuming one forgets the Bulls falling behind 30-20 after the first quarter. But after that it was textbook fundamental play that enabled the Bulls to set a season high in scoring and equal season bests in field goals, three pointers and assists. The Bulls had 34 assists from eight players for 44 baskets, one assist more than the Cavs had field goals. The Bulls also got 19 points, seven assists and four steals from Luol Deng and a brilliant bench performance led by Taj Gibson’s 18 points and seven rebounds in just over 23 minutes. The Bulls reserves had a 50-34 edge with Nate Robinson and Marco Belinelli combining for 12 assists and Belinelli at times moving to point guard while adding 15 points and making three of four threes. The Bulls were 10 of 14 overall on threes, their best such game of the season. “The Bench Mob played great,” said Boozer, though I’m checking copyright laws on that one. The Bulls came into the game last in the league in three pointers made and taken. But they’ve moved up from the bottom in percentage to 17th at 34.7 percent after being under 30 percent the first month. “Those shots are in rhythm now,” said Bulls coach Tom Thibodeau. “That is the big thing. It is all ball movement and hitting the paint and then swinging out with the extra pass. Slowly our percentage has been creeping up. We are taking the right ones. Marco came in and got going. That was big for us. Nate (Robinson) did a solid job. Luol is starting to find his way (with threes). If you like classic basketball play, if not necessarily close games as the Cavs fell to 8-28 with their 11th straight loss to the Bulls, then Monday’s in the United Center was a clinic. It was high IQ basketball, immediately identifying mismatches and going to them, moving the ball side to side relentlessly and making plays, interior passing by the big men that was reminiscent of the Knicks of the early 1970’s and the Kings of the early 2000’s, five man units whose play was an art form of precision and proficiency. Though the Bulls trailed badly in the first quarter, the margin didn’t last long as the Bulls were back into the lead three minutes into the second quarter. It was a somewhat maligned reserve group with Deng and Joakim Noah who got it going in the second quarter with two Belinelli threes and one by Deng less than three minutes in, all assisted by Robinson, who also set up Taj Gibson inside. The ball was hopping, as Thibodeau likes to say, leaving Cavs’ defender in a bobblehead mode as they attempted to follow the bouncing ball. Gibson, who has been coming on, finally, muscled inside with spinning and drop step moves for strong baskets. Belinelli made an unlikely driving, underhand layup to give the Bulls a 39-38 lead midway through the second quarter before Deng quickly identified a switch and went over Shaun Livingston for a score. Hinrich drove and kicked out for another Belinelli three, Boozer hit a baseline fadeaway, Jimmy Butler went in among the bigs and tipped out a miss that Gibson followed with free throws, Noah posted up and found a cutting Butler, who was fouled and Belinelli closed the first half with the Bulls back on top 53-50 with a drive and reverse off a Boozer inside handoff. The Bulls third quarter broke apart the game with 10 assists on their 12 baskets while going hard inside for 10 of 12 free throws and an 88-72 lead. 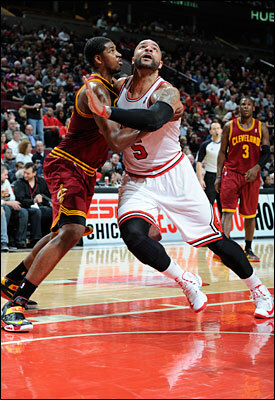 The Bulls opened the third with Hamilton making a sharp inside pass to Boozer, who was fouled. Boozer, averaging 23.2 points and 12 rebounds the last five games, then put back a Noah miss as the Bulls were back to their rebounding dominance with a 47-31 edge. The Cavs tried to hang in with rookie Dion Waiters leading with 18 points off the bench, though Hinrich again did a terrific job limiting Irving, who had 15 points and shot just four of 11. “They come out with a different aggression that our guys have to get used to,” said Irving. Noah found Hinrich in the corner for a three and 65-57 lead, Boozer scored with a jumper as Robinson penetrated and pitched. Noah found Deng with a mismatch against Waiters and Deng got a three-point play. Hamilton threw to Noah who reversed to Boozer, who was fouled as the Bulls went out ahead 81-70 with 3:31 left in the third. Deng got poor Waiters again, sealed him and Boozer was quick to find him for an 83-70 lead. Hamilton then passed to Noah for a slam dunk and a Robinson leaner closed the third with the Bulls ahead by 16. The onslaught continued in the fourth quarter as Belinelli drove and passed to Deng for a jumper, Robinson made a three and Noah found Gibson inside for a three-point play and 98-76 lead three minutes into the fourth. Belinelli passed across to Robinson for a three, Butler saw Boozer get fronted and went over the top for a three-point play and then Boozer passed to Gibson, who’d sealed his defender and dove toward the rim. 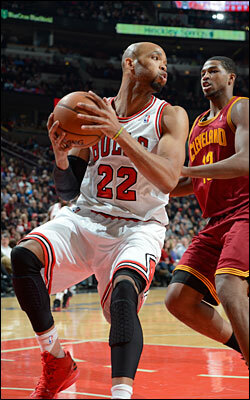 Boozer made the pass and Gibson gave the Bulls a 30-point lead with just under three minutes left in the game. The Bulls know they won’t be because they’ve witnessed so many that haven’t been. But there was no letdown after the big win in Miami. They’re playing at a near 50-win pace without Rose. So who knows. Who knows where this will go.